(Nanowerk News) A team of scientists using NASA's Hubble Space Telescope has made the most detailed global map yet of the glow from a planet orbiting another star, revealing secrets of air temperatures and water. 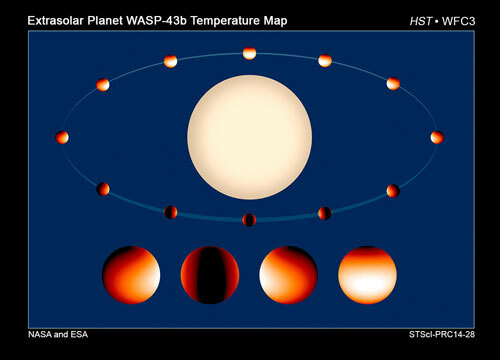 This is a temperature map of exoplanet WASP-43b. The gas giant planet orbits very close to its parent star with a period of 19.5 hours. 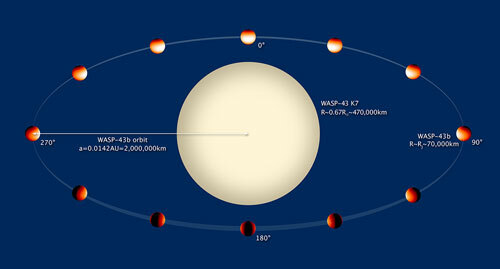 Because the planet keeps one side facing its star, there are huge temperature extremes between the day and night sides. The white-colored region on the daytime side is 2,800 degrees Fahrenheit. The nighttime-side temperatures drop below 1,000 degrees Fahrenheit. This steep gradient is in stark contrast to the predominantly uniform temperatures of the solar system's giant planets. Infrared observations with the Hubble Space Telescope measured how temperatures change with both altitude and longitude on the planet. However, the water abundances in the giant planets of our solar system are poorly known because water is locked away as ice that has precipitated out of their upper atmospheres. But on "hot Jupiters" -- that is, large planets like Jupiter that have high surface temperatures because they orbit very close to their stars -- water is in a vapor that can be readily traced. Kreidberg also emphasized that the team didn't simply detect water in the atmosphere of WASP-43b, but also precisely measured how much of it there is and how it is distributed with longitude. For the first time astronomers were able to observe three complete rotations of a planet, which occurred during a span of four days. This was essential to making such a precise measurement according to Jean-Michel D?sert of the University of Colorado, Boulder.